General Awareness is one of the most important topics that that one needs to study while preparing for most of the Government Exams like SSC CGL, SSC MTS, IBPS PO, IBPS RRB, IBPS Clerk, IB ACIO, UIIC, OICL, etc. It is imperative that you have basic knowledge of General Science, Geography, Social & Economic Issues, Environment, History, etc. One of the most important topics that are asked in History for General Awareness is Kingdoms and dynasties, major Wars & Battles, etc., are asked in the exam. 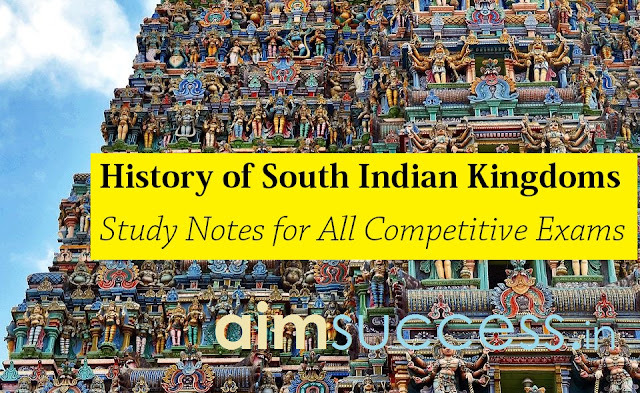 Read the given article which will help you prepare the History of South Indian Kingdoms in India. Experts believe that the history of the South Indian Kingdoms spreads over 5000 years. Southern India was considered to be undisputed in the ancient era by the invaders until the British entered this region. When historians talk about the history of South Indian Kingdoms, they will surely emphasize on three most important dynasties – Pandyan, Chola and Chera. Let’s have a look at these three dynasties in the chronological order and also understand their significant achievements. Among all the South Indian Kingdoms, the Pandyan Dynasty has got a lot of attention. They initially ruled over their country, Pandya Nadu, from a seaport called Korkai, which was on the Southern-most tip of the Indian subcontinent. Later on, they moved their headquarters to Madurai. Pandyans were famous for their contacts and diplomacy; in fact, they even had their contacts with the Roman Empire. Marco Polo, in the 13th Century AD, mentioned that the Pandyan Dynasty was the richest empire in existence. The Pandyas have been believed to be found five to six centuries before the birth of Christianity as their records of existence have been found in records dating back to as early as 550 BC. The Sangam Literature’s early Pandyan Dynasty faded into oblivion with the invasion of the Kalabhras. The Pandyan Dynasty was revived under Kadungon in the early 6th century who hunted the Kalabhras out of Southern India. To gain supremacy in Southern India, the Pandyas allied with the Cheras and the Sinhalese and took on the Chola Empire. The Pandyas of the later generations (1216–1345) set their foot in the golden era under the leadership of Maravman Sundara Pandyan and Jatavarman Sundara Pandyan. They expanded the Pandyan Empire into Telugu country and conquered Kalinga (now called Orissa). The Pandyas also invaded and conquered Sri Lanka. The headquarters of the Chola rulers was the fertile valley of the Kaveri River. From there, they ruled a significantly larger portion of land in the later part of the 9th Century till the beginning of the 13th Century. Under Rajaraja Chola I and his son Rajendra Chola I the Chola Dynasty flourished and became a military superpower. Its economic and cultural power was also very notable and resonated in the works of literature of South Asia and South-East Asia. The successful expedition of the Ganges by Rajendra Chola I was of great significance to the Chola Empire as it sent a very strong signal to the superpowers of the world. During the period of 1010 to 1200 AD, the Chola Empire expanded from the islands of Maldives (in the south) to the banks of the Godavari River (in Andhra Pradesh). Rajaraja Chola flexed his muscle by conquering peninsular South India and annexed parts of Sri Lanka and islands of Maldives. He also sent an expedition to North India and was victorious as he defeated the Pala ruler of Pataliputra, Mahipala. Rajaraja Chola also successfully invaded kingdoms of the Malay Archipelago. During the Mauryan Period, the Cheras and their counterparts the Cholas and the Pandyas exhibited high feats of economic, diplomatic and warfare tactics. Their flourishing trade with the Roman Empire and the cultural exchange with Northern India contributed to the state formation of the Cheras. They probably expanded their kingdom from the Kuttanad region (present central Kerala) to northwards (Kudanad, Puzhinadu) and eastwards (Kongunadu). Although the battles of Chera rulers and Pandyas and Cholas are famous, there are other battles with the Kadambas of Banavasi and the “Yavanas” (Romans) on the Indian coast that brought the Cheras into the limelight. The Sangam literature describes a long chain of the Chera rulers and their escapades. Senguttuvan Chera (the Red/Good Chera) was the most powerful and celebrated Chera Kings who also found a place in the legendary Tamil epic Silapathikaram. Under the rule of King Senguttuvan Chera, the Chera Kingdom stretched from Kollimalai in the east to Tondi and Mantai on the western coast. The notable victories over Kadambas, “Yavanas” and the Kongu rulers made King Senguttuvan Chera very prominent in Southern India. After 2nd Century AD, the Chera Dynasty started losing its sheen and it saw a rapid decline in stature and power. The Chera Kingdom also had a famous seaport called Muziris, which was central to all trade between the Middle East and the Southern Europe. Items that were exported to these regions were gems, pearls, timber, ivory and spices. It is believed that the Romans built a Temple of Augustus at the Muziris. This was the evidence of foreign trade that could be seen all over the Malabar Coast, Karur and Coimbatore districts. By the 3rd and 4th Century AD, the Pallava Dynasty had risen to power and was a formidable opponent to the existing dynasties of Southern India. The term Pallava means creeper and is the Sanskrit version of the Tamil word Tondai. The Pallavas were a local tribe that rose to their reputation in the Tondainadu region. The Pallavas often got into the battle with the Kadambas, the rulers of northern Karnataka and Konkan somewhere in the 4th Century AD. So this was the detailed account of the History of South Indian Kingdoms.